Pantomime was popular entertainment during the Victorian Period. 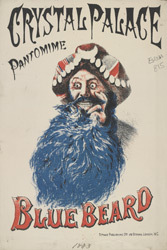 This one, staged at Crystal Palace was ‘Bluebeard’, it is the story of a powerful nobleman, living in the Middle East. He kills his wives as he becomes bored with them but he underestimates the resourcefulness of his most recent wife. There were many variations on the plot of the pantomime but the props and scenery would have enhanced the mystery and opulence of the Middle East. Bluebeard looks very menacing in this advert.